Nice shots Loke, but a bit small. Maybe should post a larger version. 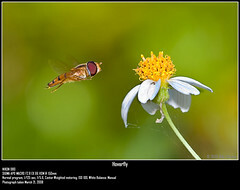 By the way, the hover fly shot would look really nice if the bg is green. It's not? Then what is it? Its seems like a dronefly to me too. A picture of Hoverfly I took sometime back. I think drone fly is just a type of hover fly that look like drone bees. I had saw a few websites while researching for more information previously. Many of them have different opinions. You might be right though, some claim that hoverfly is actually a "general name" for a family of identical genes (something like that ). Last edited by Goondoo; 3rd Mar 2009 at 14:22.